Thirty five years ago when I was first married, we invited my in-laws over for dinner. DH decided I should roast a turkey. Unlike, most of my female friends whom actually learned to cook from their mothers, I had no interest at that time. I think this was a result of being a Tomboy. So therefore, when I got married, I rather suddenly had to either figure out how to cook things myself or call my Mom on the phone for directions. (I did both). I defrosted the turkey in water in the sink and then placed it in the refrigerator. The day of the dinner party, I followed the directions on the turkey label and roasted the turkey. It came out perfect, except for one thing. I wound up roasting the turkey, the stuffing, the giblets bag, the neck and the gravy packet inside the turkey. My Father-in-law was a great home cook and he just shook his head smiling from ear to ear. Both DH and I were laughing about it. After all it was pretty funny. The recipe below can be made with any boxed stuffing mix, however I use Stove Top Stuffing for Turkey. This recipe enhances the mix producing a sweet and savory stuffing. When stuffing the bird, don’t forget to stuff the front area where the neck was attached. I stuff that section first so I can stand the bird up without the breast cavity stuffing falling out. Add butter, pineapple, pineapple juice from can, into the prepared stuffing and mix thoroughly. After taking out the neck, giblets and gravy packet, I rinse the turkey inside and out being careful not to splash any water off the bird that might contaminate my work surface and then pat it dry with paper towels. Place bird in a pan big enough so the bird has some space around it. Use a second empty bowl to help stuff the bird. Use spoon number 1 to place the pineapple stuffing from 1st bowl into the 2nd bowl, and use spoon number 2 to take it out of the 2nd bowl and stuff the bird. 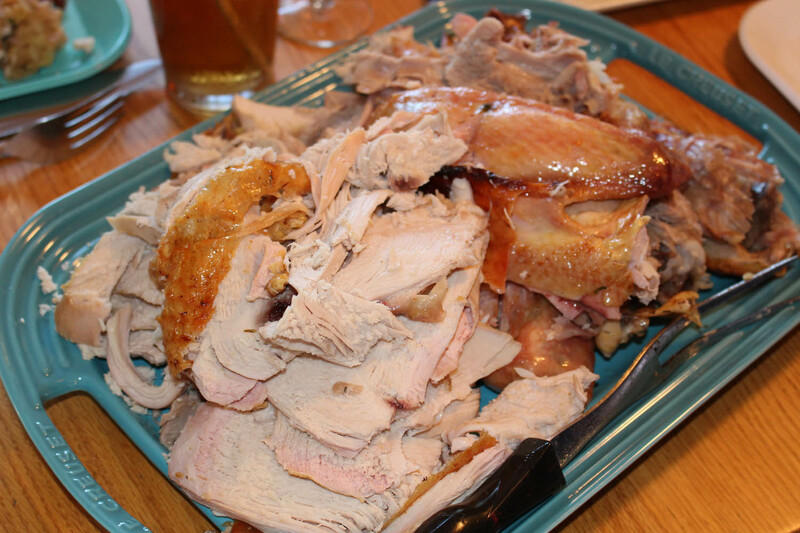 (Continue this process until whole bird is stuffed; this process does not contaminate any stuffing that doesn’t fit into the turkey with raw turkey juice). Any remaining stuffing, refrigerate until turkey is finished. At this point you can truss up the legs and pull the flap of skin over the stuffing. (I skip this). Mix olive oil and thyme together and rub over entire bird until the skin is completely coated. Place turkey in the oven and roast for 20 minutes at 450 degrees F, then reduce heat to 325 degrees F and roast for 220 minutes. Take turkey out of the oven and let it rest for 20 minutes. While it is resting, I remove the stuffing and place it in the bowl with any leftover stuffing that didn’t fit in the bird. Check the temperature in the thigh, as it should be between 180 – 185 degrees F.
DH slices it before it gets to the table, whereas my Dad always carves at the table. (Your choice).